This report reflects the findings of a high-level International Fact-finding Mission that visited the villages and townships of al-Naqab/Negev in southern Israel just after the publication of recommendations by the government-appointed Commission for Regulating Bedouin Settlement in the Negev, headed by former Chief Justice Eliezer Goldberg. The Goldberg Commission has augured a new way for the State of Israel to deal with the Naqab’s indigenous citizens, part of the Palestinian people. The fact-finding on the ground and subsequent monitoring of legal and policy developments, particularly house demolitions and dispossession revealed in this report, show a continuity of institutionalized discrimination, a fact that the Goldberg Commission recognized while interpreting Israeli law as applied to the affected communities. 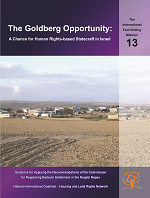 This report by eminent experts in their respective fields proffers advice to the Government of Israel (GoI) as to how the Goldberg recommendations and other criteria can be applied consistent with human rights, the principles of nondiscrimination and indivisibility of human rights and reparations for cumulative gross violations. By putting the Naqab case in a context of international norms and practice, the investigative team sets out the legal, moral and ethical framework for problem solving by providing a critical view of the Goldberg recommendations, particularly challenging its assumptions that (1) solutions be subordinate to standing urban plans and (2) that the collective land claims—in particular, pasture lands—remain outside any proposed solutions. However, the report also supports the Goldberg Commission’s recommendation that the GoI pursue ethical solutions beyond the text of Israel’s laws and policies, institutions and practices, as these constitute an essential part of the problem of continuous dispossession and conflict. 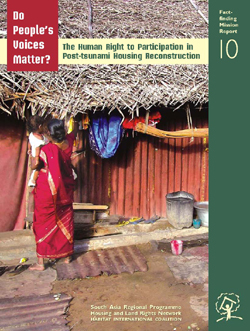 The report concludes with a set of 18 points of needed actions and measures for planning and development that should result in recognition of the existing villages; an end to home demolitions; provision of rights, responsibilities and services on a par with other citizens of the state; and reparations for past harm. On the basis of its findings, the Mission, therefore, recommends a fundamental change in state policy toward citizens outside the classification of “Jewish nationals,” generally, and the Arab and Bedouin citizens, in particular. The fact-finding team shows how that can be achieved by applying human rights principles and instruments, including the state’s treaty obligations, in the determination of planning criteria, corresponding administrative procedures and means of development, as specified in the body of this report. Black American farmers have lost 98% of their lands since 1920 due to discrimination. See report on this siite under Documents/United States of America/"Investing in Housing, and Racism affecting People of African Descent"